The 3M™ Half Face Piece Reusable Respirator when used with the correct P100 filter cartridges offers protection from a wide variety of particulates and gases in many environments including those areas where lead dust is present and will keep you compliant with the EPA’s RRP Program. The four point harness system with this mask makes it easy to use when quick dawning of the mask is required. Made of lightweight soft materials with the easy to adjust head straps it creates a comfort level that promotes the use of the mask and will help you, your employees and sub-contractors to stay in compliance with the RRP program from the EPA. This respirator was designed to be a maintenance free item with the exception of changing the filter when it has been used to its capacity. When properly fitted and used with approved 3M filters this respirator will provide comfortable protection that surpasses any disposable respirator. This reusable respirator is very effective for filtering out hazardous microscopic particles which will protect the user's respiratory system against particulates. 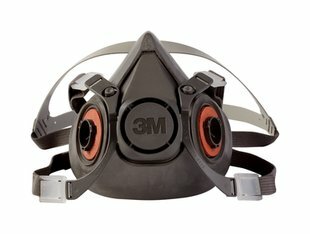 This 3M mask should be in every RRP professional’s tool box. Because of the low maintenance and cost you can stop using the disposable paper masks which in turn will cut your costs and will promote the use of this mask. This means fewer masks used, which in turn will lower the cost for you and your company while you still have access to a good quality NIOSH respirator that is RRP compliant. Complies with the EPA RRP Law (Regulation 40CFR 745.80 subpart E). Ideal for employees or contractors who need a respirator job after job. Comfortable and lightweight with an easy to adjust harness system. Available in three sizes - Small, Medium, and Large. Low maintenance with easily replaced filters avail at LeadPaintEPAsupplies.com. Are incredibly comfortable which leads to better compliance. Can be used for sanding, lead abatement, and mold as per EPA standards. Meets OSHA standards and NIOSH apprved. Do you need repalcement P100 Filters? **This reuseable mask sold through LeadPaintEPAsupplies is intended for use in the occupational workplace within the United States and all Occupational Safety and Health Administration (OSHA) guidelines for Personal Protective Equipment (PPE) must be adhered to when using the mask. By misusing this mask you could be putting yourself at risk that may result in injury, sickness or death. All directions that come with the mask should be read prior to the use of this mask.